Over the weekend we reported that in the aftermath of China's crackdown on capital controls, "Chinese buyers have left the U.S. housing market." But if potential Chinese buyers are unable to transfer funds out of the mainland, it wouldn't be just the U.S. and Australia where the housing bubble is now rapidly bursting, it would be everywhere else too as said potential buyers hunker down and instead scramble to avoid the government's attention and to preserve dry powder. 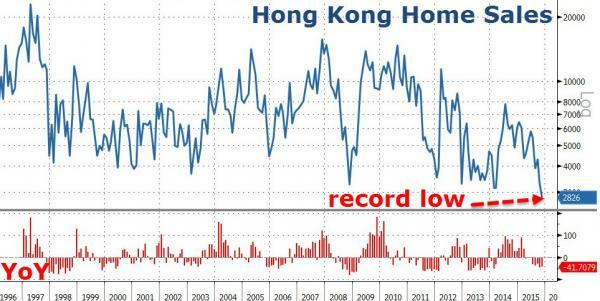 Sure enough, nowehere was this more clear overnight than in Hong Kong, where the once-upon-a-time raging housing bubble just got its last rites after November home sales sank to a record low as an imminent interest rate in the US this month scared away prospective buyers. According to Land Registry data, reported by SCMP, November saw 2,826 registered residential transactions, down 14.4% from October and 41.7% less than in November last year. This was the lowest print in the history of the series. In terms of value, residential transactions dropped 7.7% month on month to HK$20.8 billion. “Total home sales including those in primary and the secondary market dropped to the lowest level since we have started to gauge property transactions in 1996,” said Wong Leung-sing, an associate director of research at Centaline Property Agency. As cited by SCMP, he said prospective buyers in general held back their purchases in view of softening home prices and a potential rate hike also dented interest. Given the peg of the Hong Kong dollar to the US dollar, any increase in interest rates in Washington would impact the home market here. “Sales volume in the secondary market fell for the fourth straight month to a 20-year low,” Wong said. That... and not to mention the whole Chinese economy grinding to a halt while severely limiting capital flows to avoid further uncontrolled devaluation of its currency. Hong Kong home prices fell 4.5 per cent after peaking in September, according to the Centa-City Leading Index, but was still up 6 per cent from the beginning of the year. Last week, 20 out of 50 housing estates monitored by Ricacorp Properties recorded zero transactions. The weakness was sharp and widespread: sales of new homes also declined to a three-month low, said Centaline. In the primary residential market, the number of home sales also declined 26.4 per cent month on month to 1,023 last month, according to Centaline. The total value reached HK$8.97 billion, down 15.4 per cent from October’s HK$10.6 billion. “The fall in transaction volume and value for new home sales due to an absence of big project launches early last month,” said Derek Chan, head of research at Ricacorp Properties. He expects to see an obvious increase in sales of new homes this month given more major projects are due to be offered for pre-sale. “Most of new projects launches will focus in the western New Territories ,” he said. Optimism is good. But in the meantime, it will have to overcome a surge in supply: in the upcoming weekend, more than 570 units in four new projects are due to be offered for sale. They are 238 units in the second round of Cheung Kong Property’s Yuccie Square in Yuen Long, Sun Hung Kai Properties will kick off the sale of the first batch of 269 units at Park Vista in the same area, Henderson Land Development will put 38 units at The Zutten in To Kwa Wan while Chinachem Group will release 33 houses and villas in Tuen Mun. If and when this global housing luxury weakness mostly due to the withdrawal of the Chinese marginal "hot money" buyer crosses back into the Chinese border, all bets about the so-called tepid Chinese economic will be off, and since it will be just the moment when China resumes cutting rates, devaluaing its currency and maybe even officially (as opposed to the ongoing unofficial iterations) launching QE, that will be when one should buy commodities, as China does everything in its power to keep the house of $30 trillion in cards from toppling and sending a deflationary tsunami around the entire world.